And the Ash'arites have held the view that Allaah commands and prohibits us from eternity whilst there was no created being (present) with Him, saying, "O Prophet, have taqwa of Allaah" (33:1), "O you who believe, have taqwa of Allaah" (2:278), "O mankind, have taqwa of your Lord" (4:1). And if a man sat in a vacant, empty place without a servant being present with him and said, "O Saalim, stand", "O Ghaanim, eat", "O Najaah, enter" it would be said (to him), "Who are you calling out to?" and he replied, "To servants that I wish to buy after twenty years from now", then every sane (intelligent) person would impute foolishness and idiocy to him, so how then is it befitting from them that they ascribe (issuing commands and prohibitions) to Allaah in eternity? Before we see Ibn Taymiyyah put the donkey in his place, it is important to provide some background to the above so the reader can appreciate what is going on. We have three points below, 1) a general historical note on the Kalam Dynasty (a bunch of families), 2) a specific historical note about Allaahs' speech and the Qur'an and 3) the connection of this to the quote above. First: The "Kalam" Dynasty: The conceptual baggage and terminology of Aristotle had affected and influenced the Jews, Christians and Sabeans in their theology. In their writings and heritage can be found what later become known as "ilm al-Kalaam" amongst the Muslims (study this series on Aristotle, Philo Judaeus, Augustine, the Mu'tazilah and the Ash'aris). This heritage came to the Muslims through al-Ja'd bin Dirham, al-Jahm bin Safwan (heads of the Jahmiyyah) and was transmitted subsequently through the Mu'tazilah, Rafidah, Kullaabiyyah, Karraamiyyah, Ash'ariyyah, Maturidiyyah and Saalimiyyah to the rest of the Ummah. This conceptual baggage is that of jawaahir (substances), ajsaam (bodies) and a'raad (incidental attributes). Using this terminology all these Kalaam groups were clinging to an alleged rational proof called "hudooth al-ajsaam" which argues that the presence of sifaat (attributes) or a'raad (incidental attributes) or hawaadith (events) in the bodies and entities making up the universe proves they are originated and due to the claimed premise of the impossibility of an endless chain of events in the past, all bodies must have a beginning, proving the universe is originated and therefore has a Maker. When they argued this case, and made this argument to be something which the very truthfulness of the deen of Islaam rests (a gross error), they had to be consistent and make sure their theology (how they describe Allaah) remains consistent with the demonstration of this proof, leading them to their Aristotelian Tawhid, the Tawhid characterized through the conceptual baggage and terminology of Aristotle. In other words, Allaah is not a jism (body), not a jawhar (substance), not an 'arad (incidental attribute), does not have a jihah (direction), is not in a makaan (place), does not have fi'l (action) and so on. Thus, their deity became spoken of exactly like the "first cause" identified by Aristotle in his Metaphysics treatise (whose conceptual baggage they had used in the process) and which is reduce to an "immaterial, unembodied, immutable" being - a shorter way of saying a being from whom the ten categories of Aristotle are denied. These are the ten categories of Aristotle: Substance (jawhar) referring to all the entities (bodies, beings, things) that make up the universe. Then every one of these bodies has nine incidental attributes through which it is characterized and they are: Quantity (al-kam) - dimensions and measurable features, length, breadth, width and so on. Quality (al-kayf) - perceived characteristics, color, shape, and so on. Relation (al-idaafah) - how a substance is in relation to others, above, below, right, left and so on. Place (al-ayn) - where it is. Time (mataa) answering "when?" - temporal characteristics of the substance. Position (al-wad') - how a substance's parts are ordered in relation to each other. Action (yaf'al) acting - what a substance is doing. Affection (yanfa'il) a substance being acted upon, affected by other than it. Having (al-mulk) - what the substance has on. "The unmoved mover is infinite, since it causes infinite motion. It follows that it is also without magnitude, since an infinite force cannot reside in a finite magnitude (and there can be no infinite magnitudes); having no magnitude means that the first mover is indivisible, having no parts", (now you know where the Mutakallimin get their statements such as "God does not occupy space, God does not have spatial extension" and so on). This unmoved mover is, "eternal, unmovable and separate from sensible things" (meaning cannot be perceived with the senses, and this is what al-Jahm bin Safwan brought into the Ummah), and he also says, "God is separate from sensible things because God has no magnitude (megethos), God is without a body or a spatial existence. The reason that God can have no magnitude is that God produces motion through infinite time, which means that God must be infinite, since an infinite effect requires an infinite cause; but there cannot be such a thing as an infinitude magnitude. As being a substance without magnitude, God is without parts and, therefore, indivisible (magnitudes are divisible)", and here in the next statement we see the Tawhid of the Jahmiyyah, Mu'tazilah and Ash'ariyyah, where in Metaphysics 12, we read "the primary essence has no matter, which means that there can only be one God, since it is matter that differentiates one form or definition into many manifestations of that one form or definition. Since God has no matter, then God is one not only formally or in definition, but also numerically" and here is something else which is a parallel to the theology of the Mutakallimin, straight from Aristotle, "It has been shown also that this primary essence cannot have any magnitude, but is without parts and indivisible. But it has also been shown that it is impassive and unalterable; for all the other changes are posterior to change of place." This last statement alludes to what the Mutakallimin are upon of denying what they call hawaadith for Allaah, the denial of those matters tied to Allaah's will and choice which they call "events" and "changes" but which to Ahl al-Sunnah are Allaah's chosen actions (Af'aal Ikhtiyaariyyah), a sign of His utmost perfection. Once this is clear, you will know exactly where the Ash'aris and Maturidis are coming from and where their theology is really derived from. Denial of Allaah being above His Throne (because direction implies place which implies occupation of space which implies spatial extension which implies embodiment which is kufr because it invalidates the proof for the origination of the universe). Denial of Allaah being seen in the Hereafter (because for something to be seen it must be in a direction, and direction implies place which implies occupation of space which implies spatial extension which implies embodiment which is kufr because it invalidates the proof for the origination of the universe). Denial that Allaah speaks because speech has instances which constitute events (hawaadith) that would render Allaah a body, hence the various approaches taken towards denial of speech for the Jahmiyyah, Mu'tazilah families and pretence of affirmation of it for the Kullaabiyyah, Ash'ariyyah, Maturidiyyah families. Because this whole approach is opposed to the Qur'an and is founded upon the conceptual baggage and terminology of Aristotle, it naturally follows that those people traversing upon this path will split into groups and excommunicate each other, because whatever is not from Allaah will comprise much conflict, splitting and differing (وَلَوْ كَانَ مِنْ عِندِ غَيْرِ اللّهِ لَوَجَدُواْ فِيهِ اخْتِلاَفًا كَثِيراً), "Had it been from other than All?h, they would surely have found therein much contradictions" (4:82). And this is where domestic problems and abuse began to appear in the "Kalam Dynasty", which is made up of the following major families: Jahmiyyah, Mu'tazilah, Rafidah Mujassimah, Kullaabiyyah, Hanafi Karraamiyyah Mujassimah, Ash'ariyyah, Maturidiyyah, Saalimiyyah. Irreconcilable differences appeared amongst them and in-fighting was inevitable - some of them became Mu'attilah and some of them became Mujassimah - all on account of the same Kalaam they had entered into. The Jahmiyyah, the pioneers, were totally consistent with the requirements of this Aristotelian Tawhid and the proof of hudooth al-ajsaam they built upon it and denied everything for Allaah. Hence, no names, attributes or actions because affirming any of this would render Allah a body which would then invalidate their proof that the universe is originated, because everything we see in the universe has names, attributes or actions. The Mu'tazilah turned effeminate, lacking the boldness of the Jahmiyyah, and outwardly affirmed names, whilst denying attributes and actions (labelling them as a'raad). The Ash'ariyyah turned effeminate in relation to the Mu'tazilah and though they affirmed some attributes they followed Ibn Kullaab in his denial that Allaah has actions tied to His will (as in Allaah speaking and acting as and when He wills), as this implies events (hawaadith) which would clash with their proof of hudooth al-ajsaam. So when these domestic problems appeared in the household, fights broke out, and they got a little nasty. They all differed with each other as to what can and cannot be affirmed for Allaah, the Exalted, without invalidating the underlying proof (hudooth al-ajsaam) upon which their entire theology rests. Hence, the different degrees to which they denied Allaah's Names, attributes and actions, and the extent to which they were prepared to distort the Book of Allaah using the slogan of "ta'weel", an approach that was not entirely satisfactory and consistent (because naturally they would have to argue with each other about which specific texts require ta'weel and why, and what specific ta'weel is it, and what is the evidence for it) and hence the later ones innovated the approach of "tafweed" and tried spuriously to ascribe it to the Salaf. It is from here that their vile perception towards the revealed texts emerged, namely that Allaah and His Mesenger were forced to use "anthropomorphic" language for the benefit of the dumb commoners who were not sophisticated enough to grasp the true language of Tawhid (i.e. the language of Aristotle), and thus the Messenger very carefully and selectively spoke about Allaah's attributes and the job was then later left to the Mutakallimeen to define the true and real Tawhid using the correct language for it (meaning Aristotle's language). This is something that you will find in the writings of the kafir Ibn Sina (d. 439H) (see here), al-Ghazali (d. 505H) (see here) and Fakhr al-Din al-Razi (d. 606H) (see here). Second: The Qur'an and Allah's Speech: Now, one of the major symbols of Islamic belief to be impacted by this Hellenized theology is the issue of the Qur'an and Allah's speech. Whilst united that the Arabic Qur'an is created these Kalam families had internal schisms based upon the level and extent of their negation (ta'teel). So the pioneers, the Jahmites, they said: Allaah does not have any attributes, including speech, as it is an 'arad (incidental attribute) and ascribing it to Allaah would render Him a body. Since, Allaah does not have speech, then this Qur'an we have is just something created, its not His speech. Then the Mu'tazilah who turned a little effeminate and weren't so bold and brave as the Jahmiyyah, they said: Allaah does have speech, but it is not an attribute of His essence (hence He is not a body), rather, His (attribute of) speech is what He creates in others of speech and hence we say "the speech of Allaah", just like we say, "the Messenger of Allaah", "the House of Allaah" and so on. So this was the Mu'tazili family's solution to keep in line with that conceptual baggage and terminology of Aristotelian Metaphysics. Then along came Ibn Kullaab and he was in a sticky situation. He debated a great deal with the Mu'tazilah and Jahmiyyah. He wanted to affirm speech, but could not escape the arguments of the Mu'tazilah against him, which is that if Allaah speaks (according to His will), or does any act according to His will, then He is subject to events (hawaadith), and must be a body. 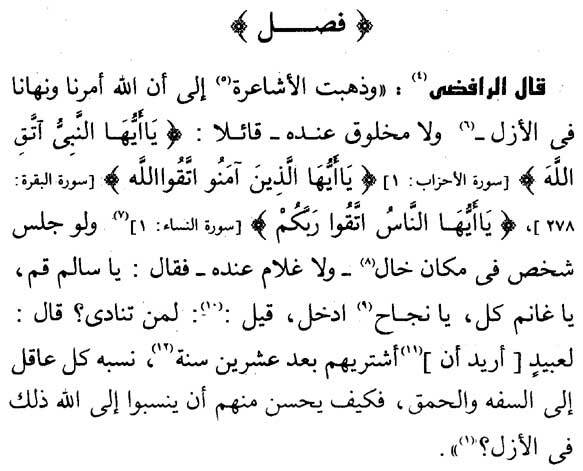 So Ibn Kullaab sought a way to deal with this, and, upon some alleged poetry of a Trinitarian Christian called al-Akhtal (see here), he simply played around with the definition of Kalaam (speeech) in Arabic, and claimed that Kalaam is only the meaning in the self, and not the actual Voice and words, and this was labelled as "Kalaam Nafsee". From here, he said that Allaah does have speech, but it is just one single eternal meaning present with the self of Allaah (like the other attributes of knowledge, life). So Allaah's speech now became one eternal meaning, and was not tied to Allah's choice and will. Then he said that the Arabic Qur'an is not the eternal attribute of speech but a created citation (or expression as the Ash'aris later said) of the uncreated meaning present eternally with Allaah's self. In this way, he found a response to the arguments of the Mu'tazili family. He found a way to affirm the attribute of speech without it necessitating events (hawaadith). This was the creed that was taken and adopted by the Ash'ari and Maturidi families. However, the Mu'tazilah came back with a vengeance and slapped this doctrine into intellectual oblivion (read this article: How the Mu'tazilah Slapped the Ash'arites Into Intellectual Oblivion and Made Mockery of Their Intelligence - Between The Multiplicity of Attributes and the Doctrine of Kalaam Nafsee). Third: Implications on This Which Leads us to the Cunningness of the Raafidee: So far, we have shown the historical development of the position taken by the Ash'aris and Maturidis regarding Allaah's speech and the Qur'an. Now the implications of this is that since the Qur'an contains commands and prohibitions, then the solution provided by the Ash'aris and Maturidis (borrowed from the Kullaabiyyah) means that Allaah was issuing commands and prohibitions to a non-existent creation, because if they claim that the Qur'an is part of a singular eternal undivisible attribute in the self of Allaah which they refer to as Kalaam, then everything that is in the Qur'an, of all the stories, all of Allaah's speech that Allaah ascribes to Himself and likewise commands and prohibitions, it was in "pre-eternity", in the absence of those being commanded and prohibited. The matter should be clear. In light of the background and history above, it should be clear, he is mocking the 'uqool (intellects) of the Ash'aris, he is mocking their solution to the problem of avoiding affirming hawaadith (events) for Allaah, and he is coming from the angle that affirming attributes for Allaah is shirk, because the Mu'tazilah deny all attributes, and so he is mocking these Ash'arites for the way in which they tackled this problem of the attribute of speech. He is saying that you have likened Allaah to a man who has no servants, and he sits alone issuing commands, "Zayd do this", "Abdullah do that", "Khaalid do this" and then when he is asked "Who are you addressing" he says "I am ordering my servants who I intend to buy thirty years from now" and through this he is mocking their belief that there was no creation and Allaah was issuing commands and prohibitions. Let's take Surah al-Baqarah (2:67 onwards) - and let's assume the correctness of the doctrine of "Kalaam Nafsee" of the Kullabi, Ash'ari and Maturidi families from the "Kalam Dynasty". Allaah, the Exalted says: (وَإِذْ قَالَ مُوسَى لِقَوْمِهِ إِنَّ اللّهَ يَأْمُرُكُمْ أَنْ تَذْبَحُواْ بَقَرَةً) [Remember] When Moses said to his people, "Indeed Allaah commands you to slaughter a cow..." So Allaah exists, no creation, no Moses, no Jews, and no cow to slaughter in existence alongside the Kalaam Nafsee from eternity. And Allaah uses the particle "idh", along with a verb in the past tense "qaala" referring to Allah, the Exalted, stating about Moses who (in the perfect tense) said that Allaah "commands", so the command had obviously been communicated to ... yes... a non-existent Moses, who was conveying it to the non-existent Jews. So then the non-existent Jews kept asking as yet non-existent questions, being pedantic, what type of [non-existent] cow and how old and what color and so on. So Allaah says, in the past tense, that the [non-existent] Jews said to [the non-existent] Moses: (قَالُواْ ادْعُ لَنَا رَبَّكَ يُبَيِّن لَّنَا مَا هِيَ) They said, "Call upon your Lord for us that He may make plain to us what it is!" And the [non-existent] Jews repeated this [non-existent] question three times, and [the non-existent] Moses responded three times with [what was from eternity the non-existent saying of a non-existent Moses]:(قَالَ إِنَّهُ يَقُولُ) He (Moses) said: "He (Allaah) says..." So [upon the Kalaam Nafsee doctrine] no Moses, no Jews, no cow, the non-existent Moses had supplicated three times to Allaah the Exalted and Allaah the Exalted had responded three times to a non-existent Moses explaining the nature of the non-existent cow that ought to be slaughtered by the non-existent Jews. And Allaah said about the non-existent Moses, "qaala", meaning "He (the non-existent Moses) said..." - that's in the past tense, that "Innahu yaqoolu", referring to Allaah Himself that "He (Allaah) is saying ...". So to get this right, Allaah the Sublime said in pre-eternity in the past tense, that a non-existent Moses had said (qaala, in the past tense) that Allaah is now saying (yaqoolu in the present tense) regarding what the non-existent Jews had said (qaaloo) in the past tense ... And after all of this to-ing and fro-ing in the past and present tense and between the non-existent Moses and the non-existent Jews, the Jews eventually did slaughter the non-existent cow: (قَالُواْ الآنَ جِئْتَ بِالْحَقِّ فَذَبَحُوهَا وَمَا كَادُواْ يَفْعَلُونَ) They said (to Moses), "Now you have brought the truth." So they slaughtered it though they were near to not doing it. So Allaah says in the past tense, (فَذَبَحُوهَا), that these non-existent Jews, slaughtered the non-existent cow, and the final part of the verse, "though they were near to not doing it" establishes that the non-existent act had certainly been completed by non-existent Jews and a non-existent cow. Now if it is claimed that all of this is simply Allaah's "knowledge" that resides with His self of the events that are to transpire when He creates the creation, then this would invalidate the attribute of "Kalaam" because this now is simply the attribute of knowledge (ilm). And as such the difference between the Mu'tazilah and Ash'aris simply becomes one of wording only, because the Mu'tazilah say we believe Allaah has knowledge and wish (ilm and iraadah) but they are synonymous with His essence, and the Ash'aris say Allah has Kalaam Nafsee, and when forced to explain the akhbaar (information) and awaamir (commands) in the Qur'an, they are forced to treat them as ilm (knowledge) and iraadah (wish) respectively, and so in reality, there is no attribute of "kalam" with Allaah, it is just His knowledge and wish. And for this reason, the honest, truthful ones from amongst the Ash'arites, readily acknowledge this and here are some articles you can read to verify yourself: Imaam ul-Haramayn al-Juwaynee (d. 478H): We Agree With the Mu'tazilah That the Qur'an is Created - We Just Differ on a Matter of Wording Which Is On Account Of What Can We Call Allaah 'Mutakallim' (One Who Speaks) - (see here). Muhammad Sa'eed Ramadan Buti: We (The Ash'aris) and the Mu'tazilah are United that the Qur'an Is Created And What the Mu'tazilah Call 'Knowledge (al-Ilm)' and 'Will (al-Iraadah)', We Simply Call 'al-Kalaam an-Nafsee' - (see here). Fakhr ud-Deen ar-Razi (d. 606H): We Agree With the Mu'tazilah That the (Recited) Qur'an is Created And Our Dispute Is One of Wording Only - (see here). And it is also from this angle that the Ash'arites received a mighty pounding from the Mu'tazilah (read this article: How the Mu'tazilah Slapped the Ash'arites Into Intellectual Oblivion and Made Mockery of Their Intelligence - Between The Multiplicity of Attributes and the Doctrine of Kalaam Nafsee). And this, O dear reader, is the type of fooling and playing around which is necessitated by the people of falsehood who speak with innovated sayings in belief that none of the Salaf ever spoke with - and we seek refuge in Allaah from what their sayings necessitate, and lofty and exalted is Allaah from all of that with a lofty exaltation! As for Ahl us-Sunnah, they say (لم يزل متكلما إذا يشاء) Allaah has never ceased to be one who speaks (mutakallim) when He wills, this being from His utmost perfection and this conforms to the clear and manifest evidences and indications in the Book and the Sunnah, and as for actions being established with Allaah, these are not "hawaadith" as the Ahl al-Kalaam understand them (created events) and it shows their ignorance of the Arabic language. Again, another honest and frank Maturidi explains this and sides with Ibn Taymiyyah on this issue (see here, and here - Muhammad Anwar Shah al-Kashmiri al-Deobandi al-Maturidi On Abu Hanifah, al-Bukhari, Ibn Taymiyyah and the Sifat Fi'liyyah and The Issue of Haadith, Muhdath, Makhluq). First, Ibn Taymiyyah responds by saying this is not the saying of Ahl al-Sunnah wal-Jamaa'ah but of the Kullaabiyyah (and it is also the saying of the Ash'arites), and they are one faction of a collection of factions (opposed to the Shi'ah) who affirm the imaamship of the three caliphs. So whether this saying is true or false, either way, it does not support your Rafidi doctrine of rejection of the imaamship of the three caliphs. The second angle: That it is said, the majority of the leading Scholars (followed by the) Shi'ah they say, "The Qur'an is not created" and this is established from the leading scholars of Ahl al-Bayt. Hence, this is a saying amongst the sayings, and (for argument's sake) if it was not truth, then it is possible for it to be spoken with other than their saying. The offspring of Alee (radiallaahu anhu), the leading imaams from them, they all held the Qur'an is uncreated (and did not hold the kalam nafsee doctrine), and therefore, even if the kalam nafsee doctrine is not the truth, there are other statements amongst the factions (opposed to the Shi'ah) which can be returned to and which are opposed to the saying of the Mu'tazilah that the Qur'an is created. The third angle: That it is said, the Kullaabiyyah and Ash'ariyyah said this (doctrine of Kalaam nafsee) due to their agreement with the Mu'tazilah in the underlying foundation which led them to that [the proof of huduth al-ajsaam], for they agreed with them as has preceded in the (view of the) correctness of the proof of huduth al-ajsaam (origination of bodies), and hence, it was binding upon them to speak with the origination of whatever is not devoid of hawaadith (events)... [then Ibn Taymiyyah goes into a lengthy discussion as to exactly how the kalam nafsee doctrine came about]... So Ahl al-Sunnah said to them [the Mutakallimoon, including Ash'aris]: "You have introduced innovations by which you claim that you are aiding Islam, but you have not aided Islam, nor subdued its enemy, rather the people of legislation and (true) reason assaulted you for those with knowledge of the texts of the Messengers know that you opposed those (texts) and that you are people of innovation and misguidance, and those with knowledge of rationally understood meanings know that what you have said opposes the rational and that you are people of error and ignorance. And the Philosophers whom you claim you are arguing against using this method (of Hudooth al-ajsaam), they saw that you have opposed clear reason. Though the Philosophers are more ignorant than you regarding the legislation and in the use of reason in theology, but when they thought that what you have people have brought is the legislation (of Islam), and they saw it to be opposed to reason, they became even further removed from both legislation and reason than you (the Mutakallimoon), and they then contested you with rational evidences and even legislative ones on account of which your inability to explain the truth in this topic was manifested. The fourth angle: That it is said: Addressing a non-existent being that has not come to be, but with the condition of its existence is closer to reason than one who speaks with speech that is not established with his self, and (closer to reason) than the Lord being stripped of the attributes of perfection and (closer to reason) than Him creating speech in other than Him and then that speech not belonging to the one in whom it was created, but the one who created it. And when He creates motion in others that motion is the motion of the place in which it was created and not of the one who created that (motion), and the same is said of all incidental attributes, whatever incidental attribute Allaah creates in a body, it is an attribute of that body, not of Allaah, the Exalted. Here Ibn Taymiyyah is defending the Ash'arite view, even though it is false and misguided, relative to the Mu'tazili view, because to affirm that the Lord speaks with Kalaam Nafsee, as the Kullaabiyyah and Ash'ariyyah believe, and may address a non-existent being whose existence is yet to come is closer to reason than affirming a Lord that does not speak at all or a Lord that has no attributes, or a Lord who is ascribed attributes which He creates in others. After this passage, Ibn Taymiyyah further addresses the argument of this Raafidee against the Ash'aris by demonstrating that even though it is falsehood (i.e. the Kullaabi, Ash'ari doctrine of Kalaam Nafsee), it can still be explained in a way to remove the claimed absurdity, making it far better than the position of the Mu'tazilah who deny speech is attributed to Allaah's self. With the Raafidah on one side and all other factions on the other, the Raafidah use aberrations (errors in belief) found with those besides them as a tool to justify their own madhhab of rejecting the imaamship of the three caliphs and other foundations of their belief. However, the Raafidah are Mu'tazilah and hence, their attempts to argue for the correctness of their doctrine of Imaamah regarding Alee (radiallaahu anhu) through the mistakes that are the mistakes of the Ash'aris, who though misguided, are not as misguided as the Mu'tazilah, then this is from the reasoning and intellect of a donkey. Meaning, that he faults the Ash'ari doctrines which even if false are closer to reason than the doctrines of the Mu'tazilah to which he subscribes, so he uses that which is less misguided (even though he holds something even more misguided on the same issue) and then uses it as an argument for the non-related doctrine of the Imaamah of Alee (radiallaahu anhu)! All people can see the stupidity of this Raafidee reasoning. Also, and more importantly, notice how Ibn Taymiyyah defends the Ash'arites against the Raafidah (Mu'tazilah) and in general, Ibn Taymiyyah's works in the field of the names and attributes are from the angle that the Ahl al-Kalaam made great errors in arguing for the foundations of the religion and this allowed the enemies of Islaam, the Philosophers, to assault them and the Islamic creed when they saw errors and what opposed reason in the polemics of the Ahl al-Kalaam, and so Ibn Taymiyyah entered the field to aid an army that is disadvantaged and in strife, so he pointed out the flaws in the arguments of the Ahl al-Kalaam, showing they used faulty goods, showed them how to use the best goods (weapons) from the Book and the Sunnah, and also demolished the weapons of their enemies and the enemies of Islaam, the Philosophers, and annihilated their claims of eternal matter, negation of the reality of prophethood and other issues of debate. Despite this, these people today, the Ash'aris, are very ungrateful (and ignorant). They are really Jahmiyyah and not followers of al-Ash'ari, because they are not upon the doctrines of Abu al-Hasan al-Ash'ari he held at the end of his life and found in his books al-Maqaalaat, Risaalah ilaal Ahl al-Thughar, and al-Ibaanah. Rather in many cases they are upon the doctrines of the Mu'tazilah and Jahmiyyah in opposition to what Ibn Kullaab, al-Ash'ari, al-Baqillani, al-Qalanisee and many others from the early Kullaabis and Ash'aris.